Search engines use the Meta description tag in their results, so this is an important tag to get right in your Web pages. Write your Meta description like a sentence, describing what visitors can expect to find on the page after they click through from the search engine. The Meta description should be about twice as long as your Title tag. Like the title, words used in the search query that are also found in the description are bolded, giving your listing another opportunity to catch the eye of the searcher. Google displays up to 160 characters for the description, sometimes extracted from the page content. If the Meta description is used for search engine results, you must put your best information right up front. No one but the spider sees it if you don’t. 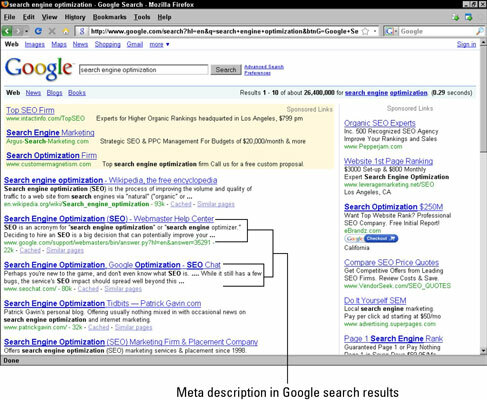 The below figure shows a Meta description tag appearing in Google’s search results. Your description should answer the question, “What is this page about?”. Try not to repeat any word more than twice; any more than that may look unnatural to users and to the engines. Ask yourself what your target audience would be looking for when searching for you and write your metadata to address that person. Notice in the figure that descriptions are in sentence form and give you a very clear idea about the content on the linked page. Your Meta description tag must be unique; that is, it has to be unlike any other on your site and targeted to the content of the page it’s on, or you run the risk of duplicate content (that is, content that appears elsewhere on your site or the Web) penalties. Duplicate content is commonly filtered out of the search results by the engines because it’s not in their users’ best interests to show the same or similar pages more than once. Even if everything else on your page is unique and useful, a duplicate tag in the head section can spell disaster for your rankings. The metadata must match your content, using the same words. Think of your metadata as the advertisement and the content as your product. Don’t be guilty of false advertising!